Is it just me or is some of the best alt-country and Americana music coming from Southern California these days? Bands like Delta Spirit and Dawes spring immediately to my mind and soon San Diego’s Blackout Party will be springing to your’s. Closed Mouth Don’t Get Fed marks BOP’s second full-length, and it’s an outstanding romp of a record. Having already been named “Best Americana” at 2011’s San Diego Music Awards, this new set of songs should help push them beyond their hometown and onto the larger scene. Dispel your preconceived notion of what “Americana” might be and instead be ready for an album full of great tracks. Sure, the album is tagged as “Americana” and while that is true, it’s also not strictly the case. There are some strong alt-country and straight-up rock jams mixed in with that Americana sound, and at the end of the day most listeners will walk away thinking, “that there is a damn fine old school country-rock album.” On the more rock-infused tracks you get a sound reminiscent of some of the best alt-country acts around. For instance on tracks like “Stronger Angel, Fiercer Devil” and “California Sky” I definitely feel a Lucero or Drive-By Truckers influence (particularly the Jason Isbell DBTs era), but that homespun San Diego vibe and distinctive SoCal “twang” remains intact. On some slower ballady-type tracks (“See You Smile” is a great example) you really hear lead singer Brian Howlerda’s passion and soulful voice; I couldn’t help to draw comparisons to some of my other favorite contemporary country crooners such as such as David Mayfield or even Justine Townes Earl. Bottom line: Closed Mouth Don’t Get Fed is one of the best records I’ve heard from ANY San Diego band in 2011. 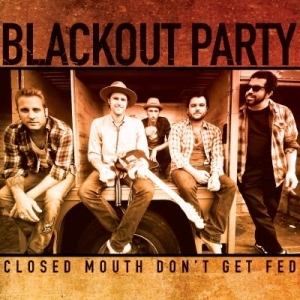 Combine with a spectacular live performance and Blackout Party is a lock to defend its “Best Americana” title in 2012. Don’t let the “Americana” (or any other “country”-sounding references) label scare you, this is a very accessible album for all tastes and one that is certain not to disappoint. The record is out now. Do yourself a favor, whatever your usual genre of choice, and check it out ASAP.